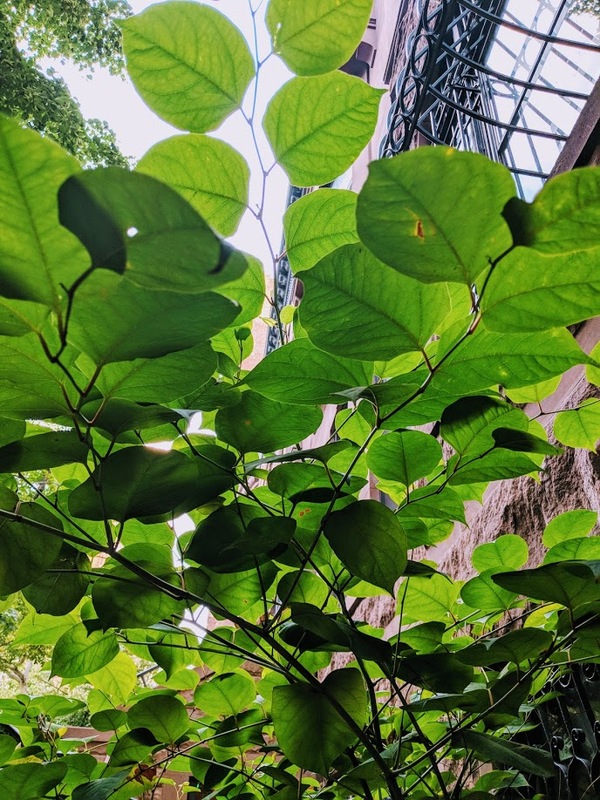 On recent evening stroll, I noticed a healthy Japanese Knotweed plant growing in front of a townhouse in my Upper West Side neighborhood. Though beautiful with heart shaped leaves and sweetly scented flowers, do not be deceived. The roots of Japanese Knotweed can rip through a building’s foundation and burst water pipes by filling them to capacity. In their search for sunlight, its shoots can push the bricks of a retainer wall out from the inside. It is in essence, one of the world’s strongest plants and I didn’t want my neighbors, unknown to me though they were, to fall victim to its aggression. I saw a light flicker on, and so decided to ring the doorbell. A few moments passed, but soon enough a man in his 80s appeared at the door. “What?” he replied, cupping his ear. “It’s very invasive,” I replied. Of course, I said yes. The gentleman whom I shall call H. led me through the foyer of what I could tell immediately was an immaculately preserved Victorian home, though I couldn’t guess at the extent until later. In the kitchen I spotted a hooded stove that retained elements of the original. But on to the garden. A solid wood door with stained glass as its window opened on to a lush landscape tucked between red brick buildings. More Japanese Knotweed shaded the edges. A Black Locust grew above a community of ferns. I ducked beneath Angle’s Trumpets and found myself utterly lost in greenery. Not wanting to tax his already generously given time, I emerged earlier than I would have wanted, though grateful for the time I had spent. I thanked him profusely, but admittedly, a little absentmindedly. The moment I started speaking, I noticed a bay window directly above his head filled to the brim with tropical plants, somewhat like a miniature arboretum. “Is that yours too?” I asked hesitantly, but at top volume. He led me up an impossibly compressed staircase designed for human as they were about 140 years ago when the house was built, thinner and shorter. We emerged into the great room of the house. All the lights were off and the natural light grew dim, giving one these that the room was shrouded not evening but in history. A chandelier hung above a set of early 20th Century couches and chairs beneath which spread an enormous oriental carpet. Walking down a different set of stairs we arrived on the first floor parlor complete with a hand carved rosewood piano. “It needs to be rebuilt,” said H., “it hasn’t been played in years.” I couldn’t help but touch its keys that may well have been ivory, yellowed as they were with age. Above, the ceiling retained its original molding, ornately decorated with fragile nasturtiums of yellow, pink, and blue. Nearby, the fireplace still had the original gas logs. Made from porcelain and sculpted to look like a stack of firewood, they would have retained and emitted excess heat from the basement’s boiler, helping to keep the whole house warm in the winter. “You’ve preserved this room remarkably,” I said. H. showed me to a different door than the one I had entered. I shook his hand. “Thank you for the tour,” I said. He looked back at me, I think still unsure of what to make of this woman who rang his bell about Japanese Knotweed.